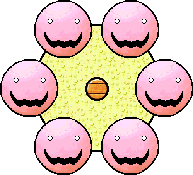 Six-Face Sal is a wooden wheel with six faces on it that appears as a boss of Six-Face Sal's Fort in Yoshi's Island DS. To defeat him, Yoshi must jump on a paddle wheel and turn it to turn the wheel to the face that enlarges. However, the face that enlarges can shoot Needlenoses out of its mouth. Yoshi must hit the pink face, not the red faces. It is unknown what species Sal is, if he is part of any species in particular. 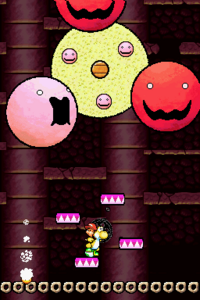 He possesses a face similar to that of Super Mario Bros. 2's Phantos, and also laughs in a way identical to Boos. This page was last edited on April 11, 2019, at 18:20.